Dressing up on my birthday presented some challenges. 1) I have very few clean clothes right now. 2) I become confused for a few days EVERY month and a simple thing like choosing an outfit becomes very challenging. 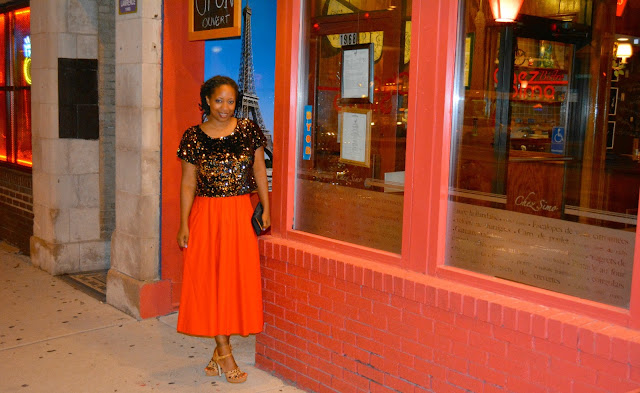 3) Since I was going on a date with my husband, I wanted short and tight but still classy man friendly attire. In my confused state, I rummaged through my nearly bare closet and found a thrifted red skirt from my vintage thrift haul. As luck would have it, my mom's birthday gift was the perfect companion to the skirt. Given the challenges of #1 & #2, I absolutely missed the mark on #3. Sequins and a long skirt ain't the business as far as E is concerned but it's my birthday so I wore it anyway. Otherwise, I would probably still be staring off into the closet. See #2. Ignore size labels. Clothing sizes differ from brand to brand and definitely from decade to decade. There's no shortage of fugly 80s skirts at the thrift but if it appeals to you, grab it. Fugly can be made beautiful. Neon was big in the 80s and it's trending now. Thrift one for real cheap. Same thing with floral or jean skirts. If that's how you get down, the thrift store is your friend. A vibrant red skirt is a standout piece on its own but feel free to kick it up another level with sequins. I did! Give your 80s skirt a fresh new look with a trendy top and fabulous shoes. A skirt with a bold psychedelic 80s print can carry your entire look. Keep the rest of the outfit simple. A high waist skirt looks great with a fitted tee. The thrift finds giveaway ends tonight. Have you entered? Ty of Words & Wardrobes put together a directory of brown girl bloggers. If you're looking for additions to your new feeder (rip Google Reader), check it out! Did you see the instagram of my awesome birthday gift? I now own a dslr camera! Do my pictures look different? I'm still operating in auto mode. I have lots to learn. The beauty department just had a great post about easing off the auto setting on your DSLR. You should read it! Love this! 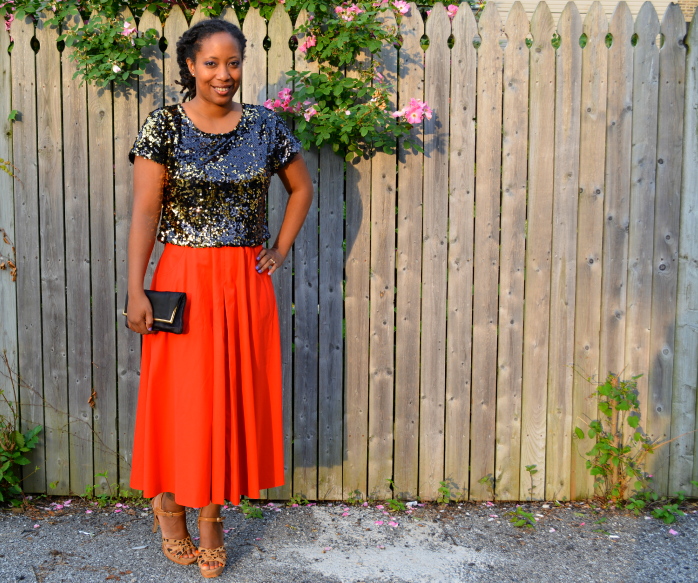 The skirt is fab and then the sequins...you nailed it lady! Very cute T. You look awesome as usual!!! Your thrifting is the best!! I love your skirt and it looks great on you! Your sandals are super cute too. Happy Bday!! Love it!! This is a fab birthday outfit! Such a fabulous outfit - I am loving that top on you! Haha man friendly! I love that you pointed out that that can be a different thing :) I think you look amazing in that outfit and I'm sure your man does too! You don't look confused at all. I'm still on Auto too. I think I'll stay there...not good with change. Nice outfit--you're gonna make me get dressed and run down to the Village. Haven't thrifted since Friday! I love the skirt! 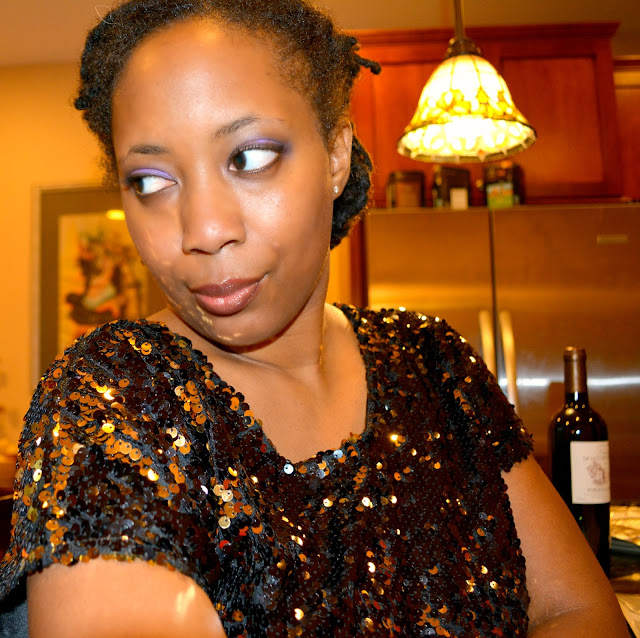 and the sequin top gave it a nice vamp up. Fab as usual! And that camera-what an awesome gift! Great thrifting tips! I need to find something neon ASAP! You look gorgeous and I hope you enjoyed your birthday. 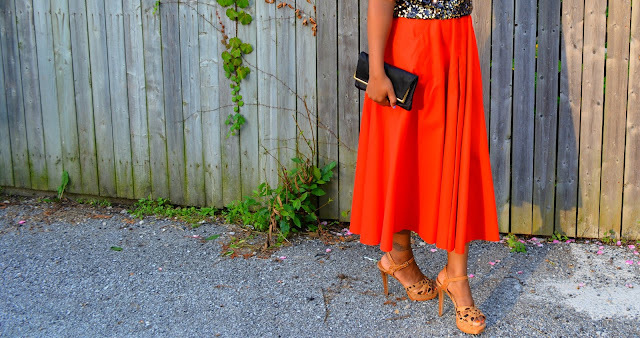 This skirt is a great color! Happy belated! Awesome! Thanks for the thrift tips....I need them! 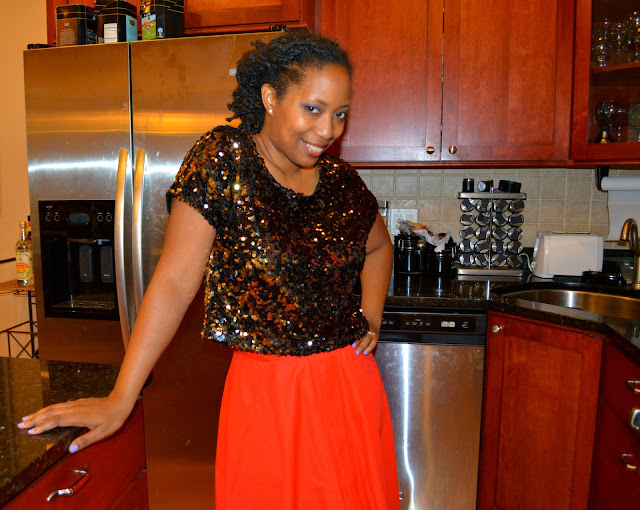 Love the bright colored skirt paired with the sequin top! Definitely a birthday worthy outfit. My goal before this month is over is add more bright color pieces into my wardrobe. I cleaned out some of my old clothes and sadly I'm left a lot of neutrals and muted colors. 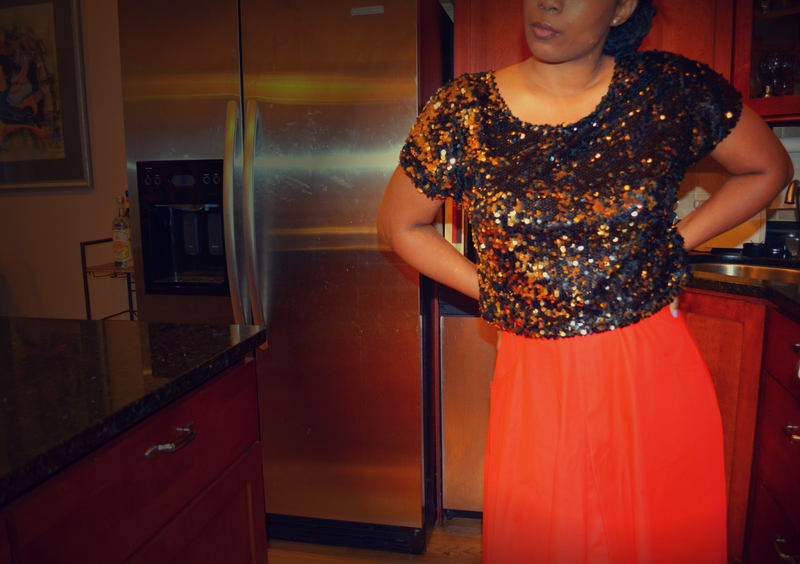 Those sparkles definitely look fab with that skirt!